This is the first of a series of interviews that we’ve had with actors from Game of Thrones, ahead of season 3. It was nice to say hello again to some of the actors, who are starting to become familiar faces, and also to meet some actors (both old and new) that I’ve never had the pleasure of meeting before. First up, here’s our interview with Michelle Fairley, who plays Catelyn Stark! 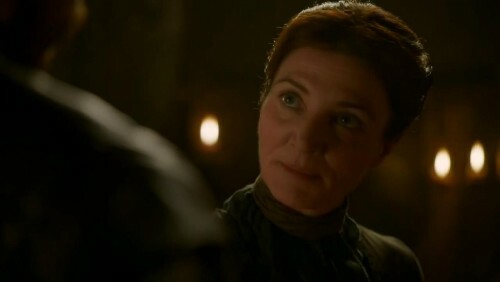 What can you tell us about Catelyn in season 3? Season 3 is very much a reflective season for her. 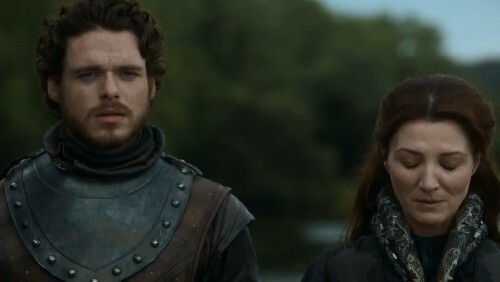 She starts it off with her relationship with Robb quite damaged. She spends a lot of the time alone, giving her time to reflect on her actions in her life and their consequences. And possibly the guilt about having done certain things make her wonder if it’s her fault that these things have happened to her family. And of course she’s still mourning her husband, and thinks her children are dead. So she blames herself, in a way, for what’s happened? She totally believes that. She starts to think about Jon Snow and things like that, and the promises she made regarding him and because she’s so religious she thinks the gods are angry at her because of those promises. Do we meet her brother and uncle this season? Yes, she goes to Riverrun this season, so you’ll see the Blackfish and Edmure. Is it a strength or weakness that she cares so much for her children? She been played for that. Littlefinger played her for that. I think that’s interesting about the characters in this. It’s about dominance in some respect, taking advantange of others for your greater advantage. It’s one of the aspects she starts this season off with, the consequences of her actions. She learns from that, she has to. She’s upped the ante and she starts to play more tactically, more like a man in that respect in order to survive. It’s unfortunate that these agonies have caused her to change. Have you enjoyed Catelyn’s progression? Yes! The way David, Dan, and Bryan write is really emotional stuff. I love the stuff in the courts as well, and it looks like incredible fun and a great craic to do, but she has a cloak of grief around her and she lives with that sorrow. She has to deal with it. To play that, as an actor, it’s wonderful. It forces you into areas that you might think you don’t want to go there. A lot of series don’t go there. When you read the script for the show, did you envision it could be this big? Oh, no. 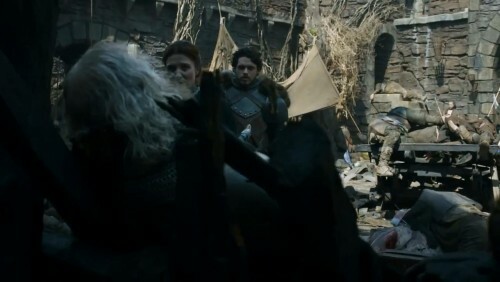 But my first filming was three days of shooting—it was the ambush of Tyrion—and at the end of that first day I was expecting someone to come by the trailer and tell me to pack the bags and go home. So once you finish that third day, that’s that done… but then you continue and you finish season one and then you have to wait to see how it’s received. Then it’s if there’ll be a season two. And so on. What do you think are the most important ingredients to the success of this show? Characters. I think it’s the characters, really. Characters that people can associate with as well. There are people who come to it for different reasons, obviously. There are people who’ve read the books and know the genre. There are people who are fantasy fans and this is what they want. A lot of the issues the characters with are issues that people are dealing with today. Great drama transcends time, whether it’s ancient Greek or Shakespeare. The show is about love, life, and grief—important issues. And survival, and war. Is Catelyn a difficult character to identify with? For me, personally, she’s very much at the center and it’s hard to identify with people at the center of things. She’s not a driving force. When Ned was alive, she had a very specific role, and since his death her role has changed substantially. She’s continued to learn and is an organically evolving human being. Her world is constantly threatend, whether by the introduction of a woman into her son’s life or an invading army trying to kill him. Her life is threatend, and to get her family back together she needs to survive. Your character has been a main character since the first season. The hype of the series has grown and grown. Has this affected your work? You want your work to keep evolving and improving, of course. To try and keep breaking new ground. Does the material help do this? Yes. To give credit where credit is due, this has all come from George R.R. Martin’s mind. And David and Dan, through years of work, have distilled this into a series. You get a script at the start of the season, and you have a read-through of season 1 to 5. And by the time you come in to film, the scene may have been rewritten ten times. And even on the set they’ll come over to you some times and say they changed something. They never sit back and assume the job is done. What’s it been liking watching some of the young actors growing up on the series? They’ve grown up so quickly! It’s fascinating to see. Watching Isaac was so amazing. The actual physical change was extraordinary. They’re a delight to be around, even though our characters don’t have any acting time anymore but when we see one another in Belfast it’s normal, like we’re old friends. Can I ask you about The Invisible Woman? We’re done filming. It was very exciting to be involved in. It was directed by Ralph Fiennes, who I think is a wonderful director. It was lovely to work with him, and he’s a passionate actor and director. The energy to do both—and he’s in it a lot. Has Game of Thrones pushed you forward even more? It’s international, this show, and you do get more attention because of it. I also do a lot of theater, which I love as well. I’ll always try to get theater in there as well, whether it’s classics or modern. I imagine working on the show is a bit different from the episode of The Clinic you were in a few years ago. Well, yes. You know, Liam—Liam Cunningham—directed that episode. On The Walking Dead, when characters are killed off they have death dinners. Do they? I love that program, and I know some of the actors personally. But the nature of our series is that we often don’t see one another all the time, so that doesn’t really happen. If you’re really fortunate, you might have a night and the phone rings and one of the fellow actors ask you to dinner—but they’e just finished filming while you’re up at 4 AM for filming the next day. How far have you read into the series? When the series started, I read the first one, and then read the second. But then I realized that they weren’t sticking to the novels, that there were aspects that they used and not others. But I used the books as references as it’s an insight into the mind of the character. Though, that said, sometimes David and Dan don’t want that particular insight… so the scripts are the bible, and the books aren’t so important anymore.